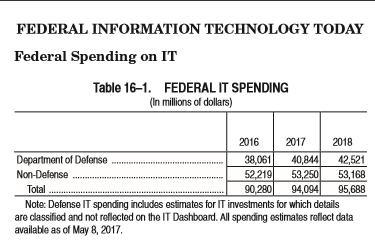 President Donald Trump’s fiscal year 2018 budget proposes to spend $95.7 billion to update Federal information technology, a 1.7 percent increase from fiscal year 2017, according to the administration. The funding request asks for investments for four functions: mission delivery; administrative services and support systems; IT infrastructure and security; and IT management; and grants. There is significant variation in spending according to agency. 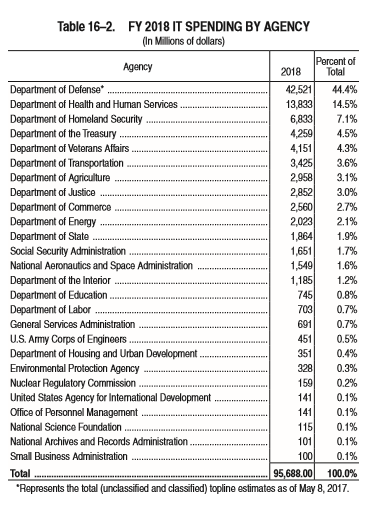 The Department of Health and Human Services spends the largest quantity of money on IT of all the civilian agencies; with the bottom sixteen agencies spending only 10.7 percent, according to documents released by the administration. 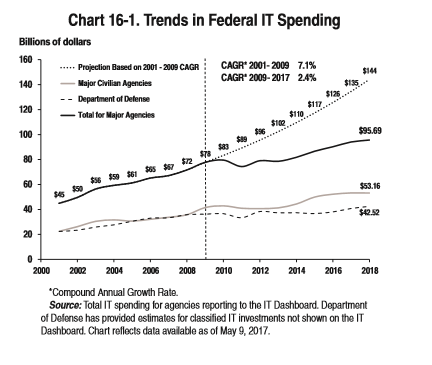 Trump’s request breaks down IT spending into categories, including modernizing government technology, creating modern citizen-facing services, modernizing and streamlining the acquisition and administrative processes used by government, continuous diagnostics and mitigation, improving data analytics and IT portfolio management, and cybersecurity. 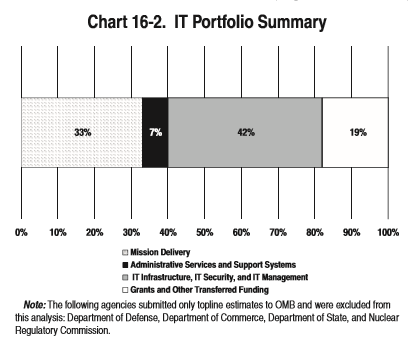 A significant portion of Federal IT dollars are spent maintaining legacy systems. Of the $48.5 billion shown on the IT Dashboard, 78.5 percent of that is spent on either operations or maintenance (O&M.) This spending goes towards existing investments.